Chinese New Year is the most significant holiday for people in Hong Kong, making it one of the most beautiful and exciting times to be in the region. From fireworks, streets decorated with lanterns, elaborate parades, dragon and lion dances, giving gifts, to large and delicious meals to be shared with loved ones. Among them, sending gifts and visiting relatives and friends are the core elements of traditional Chinese New Year customs. Since ancient times, giving New Year's gifts to families, relatives, friends, customers and business partners has been an essential part in Chinese New Year tradition. Although there are some changes over the years in terms of gift items, gift packaging, gift delivery as well as the gift recipients, the main gifts for CNY remain the same, that is, the Chinese New Year fruit basket, traditional Chinese dried seafood such as fish glue, abalones, dried oysters and scallop, tea, wine, chocolate, egg rolls, palmier, dragon beard candy, cookies and so on. The gourmet desserts are also popular New Year gifts for everyone. Each year represents a different animal in the Chinese zodiac. There are twelve animals in the Chinese zodiac, and the year you are born determines what animal you’re associated with. Similar to Western astrology, in that each animal attribution has its own personality traits and will have different levels of luck depending on what year of the zodiac it is. Just prior to the New Year, families and businesses will begin to decorate their homes with fai chun (揮春)which are bright red and golden banners and decor that containing sayings of luck and prosperity. Traditionally, these were hand painted but now you can easily find this décor just about anywhere in Hong Kong. It’s also a time when people clean out their homes and get hair cuts as it is considered bad luck to do either of these activities during the time of the New Year. On New Year’s Eve, families will gather for a reunion dinner (tyun nin fan, 團年飯). Traditionally this dinner was held at the senior family member’s home but in modern times these elaborate dinners are often held wherever convenient or at a restaurant. This same evening, thousands will line the Victoria harbour on both the Kowloon and Island side to watch a phenomenal display of fireworks that lasts up to 25 minutes. On New Years Day, an extravagant parade takes to the streets of Tsim Sha Tsui with over 30 floats and a variety of lion dances and performers. Both the fireworks and parade are spectacles that need to be seen at least once if you’re spending any length of time in Hong Kong. It’s best to get to the areas early in order to ensure a good spot to watch both events. Many villages will also light their own firecrackers during this time of year despite it being illegal. Chinese New Year takes place in either January or February following the lunar calendar. Traditionally, this festival used to take place over fifteen days but in the modern world only three days are given in Hong Kong as public holidays. However, many festivities and traditions still carry on past the three-day holiday. During the three days of public holidays it is about the only time you’ll see shops closed in Hong Kong and the once normally bustling streets become eerily quiet! Chinese New Year is a time meant to be spent with family so many people will bring the gifts to travel to see their families during this time. In fact, Chinese New Year records one of the largest human migrations, so be warned if you’re planning a trip to China during this time. During the first two days of Chinese New Year families will bring gifts to visit each other and have large dinners, which is a very important etiquette. Often wearing brand new clothes. Families will also take this time to visit temples in order to seek out blessing and luck for the coming year. Children and those who are still single will receive lai see (利是) packets, which translates as “lucky money” from family and friends. These little red envelopes contain money, often newly issued and never in unlucky denominations, for example, the number four (sei, 四) is the homophone for death (sei, 死). Lai see is also given by bosses to employees, married friends to their unmarried friends, and married couples will often give to those who provide them a daily service like a doorman or a security guard or even a venue that is visited often. You’ll hear many people wishing each other Kung Hei Fat Choi 恭喜發財, which translates to “congratulations and be prosperous”, the meaning behind the saying is derived from the legend of Nian and the origins of Chinese New Year. Traditionally, the third day of the New Year, used to be a day to avoid visitors as it was generally considered bad luck to have guests or to go visiting on this day. It’s a day that was typically spent burning effigies, last years New Year décor, and paper offerings over fires. In modern day, many in Hong Kong don’t take note of the superstition so other events take place on this day, like the Hong Kong Jockey Club horse races that takes place on the third day of Chinese New Year. Another popular event during Chinese New Year in Hong Kong, is the Well-Wishing Festival. This event takes place in Lam Tsuen (林村) in the New Territories with festivities taking place over the entire fifteen-days of the New Year. In Lam Tsuen, there are the Wishing Trees, in which you can write a wish attached to a string with an orange on the other end. You then throw the wish and orange up into the tree. You can also release a wishing lantern at the nearby river and participate in the carnival. This is a good place to visit if you missed out on the New Year’s parade as the festivities and parade floats continue on during the Well-Wishing Festival. Even though many businesses resume as normal after the three-day public holiday, many schools and some businesses will remain closed longer. People will continue to give out lai see and wish people Kung Hei Fat Choi, and you’re certain to see a variety of lion dances that continue in neighbourhoods all over Hong Kong. The last day of Chinese New Year, the fifteenth day, is called the Lantern festival (jyun siu zit, 元宵節). It is also the first full moon of the New Year, which is what signifies the end of the New Year’s celebrations. Illuminating lanterns is a way of wishing a good start to the New Year. Hong Kong holds beautiful Lantern Festivals in a few different spots during the time of Chinese New Year and is often accompanied by dancers and other acrobatic performers. The Lantern Festival is also the equivalent of Valentine’s day in the West so couples will often spend time together and go on dates. Although gift-giving is an indispensable manner on Chinese New Year, some people can not visit their families and friends in person because of their busy lives. 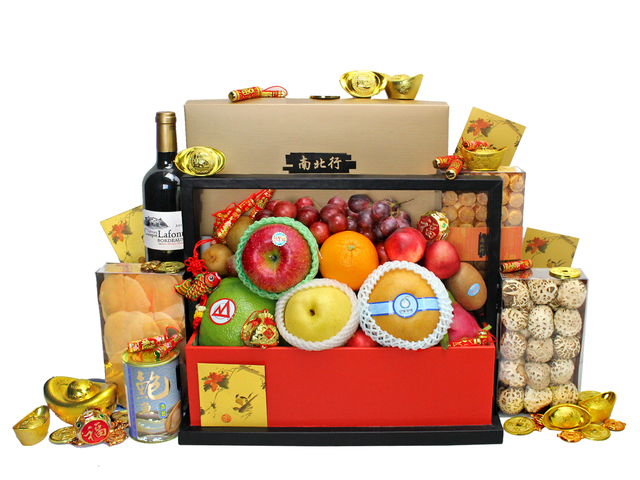 However, with the development of online shopping, ordering Chinese New Year gourmet gift hamper online has become a popular trend. The CNY gifts are not only with plentiful variety and exquisite in packaging but can also be delivered to your doorstep which is convenient and fast. This is a Hong Kong GGB original 'Hong Kong Chinese New Year Gift Giving Customs, New Year Traditions and Celebrations' blogpost.